This exhibit is a combination of a previous installation at Polvo in June of 2006 and the elaboration of new works which are also a series of combining techniques that intertwine with earlier works, documents and mixed images to form a whole of comings and goings between that two-decade long period of imprisonment and the subsequent works from a decade that feels like two. 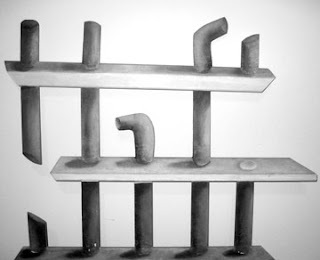 The installation started from a series of drawings I did in prison about jail bars transmuting into sculptures. From there, constructions, mixed media and three-dimensional works emerged. The “extension” of those pieces has taken different, but limited, forms, due to the issue of transportation. The new works have trace marks of both before and after the installation, which makes it hard to know what came before and what came after. Here there is a type of self-intervention and variations where there are transferences and painting over transparencies, documents and reproductions altered in scale and context, sequences, series and digital pieces. The theme of jail bars and the prison experience have imposed an autobiographical and political atmosphere, but always through the symbolic of art as an exchange between the spectators and the work. Buen provecho. June 1st, 2009 marks the 50th anniversary of uninterrupted publication of CLARIDAD, the newspaper of the Puerto Rican Nation. From that moment, a commemorative campaign in solidarity with the 50th anniversary of CLARIDAD began, with multiple activities in Puerto Rico, the US and other Latin American countries. The first activity of this campaign was the photographic exposition at the International Press Center in Havana, Cuba, a country which has been in solidarity with our struggle for independence. During this camping we propose to make widely known the importance of CLARIDAD through it's history of our struggle for independence, human and civil rights and social justice and as a newspaper that has stood out in defense of the Puerto Rican working class, the environment and our natural resources and against militarism, corruption, discrimination and repression. We aspire to continue to fortify the Puerto Rican patriotic movement and reach sovereignty and independence. The photographic sample of this exhibition in Chicago is organized by the Campaign fo the Celebration of the 50th Anniversary of CLARIDAD which is directed by Attorney José Enrique Ayoroa Santaliz , and The Puerto Rican Cultural Center Juan Antonio Corretjer (PRCC) and Institute of Puerto Rican Arts and Culture (IPRAC) directed by Dr. José E. López. The Committee of Photos ad Art, led by Evelyn Claudio Cartagena coordinated the preparation of the exposition which was designed by the Vice-President of the Biennel of Photography in Puerto Rico, the photographer José Rafael “Pucho” Charrón (curator) and the photo-journalist Ricardo Alcaraz.